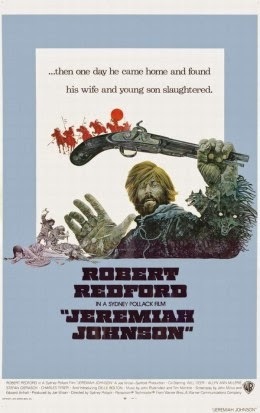 Before and after going out to see All Is Lost, I revisited Robert Redford in an earlier cinematic tale of Man VS Nature, 1972's Jeremiah Johnson. In what would be Redford's 2nd of 7 collaborations with director Sydney Pollack, Jeremiah Johnson is the tale of a wandering former soldier who arrives in Colorado to become a mountain man, hunting "bears, beavers and other critters worth cash money when skinned". Utilizing the vast landscape of Utah, Pollack alternates harsh winters and arid desert vistas to give us an idea of just how hard life could be back then. At first, Johnson struggles in the wilderness to survive, his hunting skills are lacking and he resorts to trying to catch fish with his bare hands in a frigid creek. He's taken in by a local grizzly bear hunting mountain fella who teaches him the way of living off the rock. Soon, Johnson becomes a self described "great hunter", the "fine figure of a man" who makes "damn good biscuits". Along the way he runs into trouble with a pack of tribal nations people who end up slaughtering his wife and adopted child. With nothing left, Johnson becomes a famed killer of the tribe and lives on the move, always waiting for the next attack. 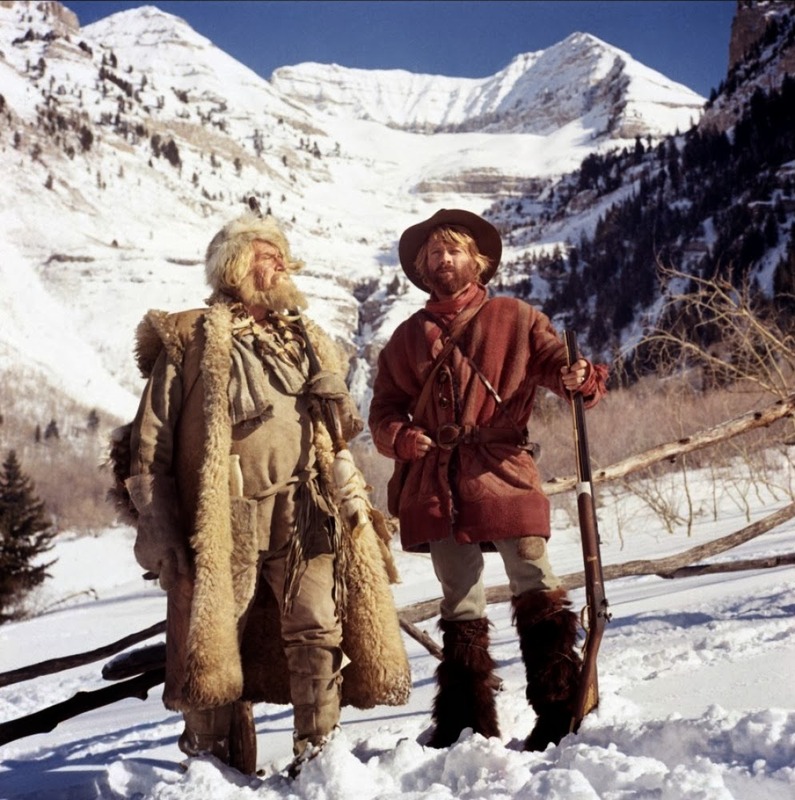 Jeremiah Johnson is a great adventure flick that strangely parallels All Is Lost on simple things like men choosing isolation over society, accepting each new uninvited challenge and never giving up. There's also weird coincidences like shaving before the storm (literal and figurative storms), forehead wound placement and screaming at the sky in both. What I forgot about the movie is how funny it is at times as well as brutal. The action is rough and tumble but still packs a wallop after all these years. Sometimes seeing a nasty, animalistic scrap is more effective than the most choreographed display of physical prowess. The film was co-written by John Milius, ya know, from Conan the Barbarian and Apocalypse Now? The guy Walt from The Big Lebowski is based on? Exactly. Having worked on many a studio picture officially and unofficially, Milius has it written into his contract that in addition to a fee, he receives a firearm of significant value. Apparently, Johnson is based on a real individual who after losing his family to braves from the Crow tribe, enlisted other mountain men and rival tribes to exact revenge over 25 years. Rumor is he would eat the liver of each man he killed as a sign of disrespect to his enemies beliefs. Respect.